We are in the process of incrementally renovating all of the individual research laboratories in one of our buildings, and have completed three labs to date. 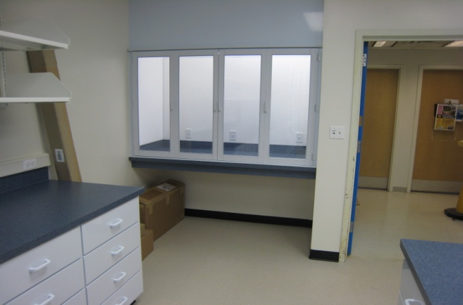 All three of these labs require non-metal construction materials, so we specified polypropylene casework and hoods. When we published our first Request For Proposal for polypropylene casework and fume hoods, using Nuaire specifications, we received our first-time response from LM Air. We had a short lead time for the construction start, and LM Air had the best proposal for meeting our short deadline, as well as the most competitive price. Until that time, we had no experience with LM Air, so we did a thorough check of their references and found them to be very good. Our lead architect and our engineering group decided to give them a try since their references were solid, they had the shortest lead time, and the best price of all the other bidders. In the past, we used Nuaire for our plastic casework and hoods. LM Air met and exceeded the Nuaire specifications, as well as the many special, challenging design specifications that we requested. Additionally, LM Air always finished on or before the scheduled deadlines. Some examples of the products that they have supplied and installed in our labs to date can be seen in the attached photos. They have installed their casework and eight hoods (chemical fume hoods, acid fume hoods, and clean hoods) in the three labs that we have renovated so far. The quality, fit, finish and function of their products have proven to be excellent. We have had no problems whatever with their products. They met and exceeded the Nuaire specifications, as well as the many special, challenging design specifications that we requested. Additionally, they always finished on or before the scheduled deadlines; there were no negative issues related to the schedule with LM Air. It’s also important to bring to your attention that we utilized LM Air for the installation of their products in these three laboratories. It’s important because the installation of these custom-made products is an essential component of the quality of the finished product. We found their installation crew to be professional, efficient, safe, and cooperative. Their customer service is the standard to judge all others by; it’s truly exemplary. In summary, we are very satisfied with all aspects of our experience with LM Air. We now specify LM Air for all of our plastic casework and hoods, including the installation. If you have any questions or desire further discussion of our experience with LM Air, please feel free to contact me. Thank you. Please look through our recently completed projects, case studies, awards, industry developments and any other relevant news. © LM AIR TECHNOLOGY INC. 2017. ALL RIGHTS RESERVED.